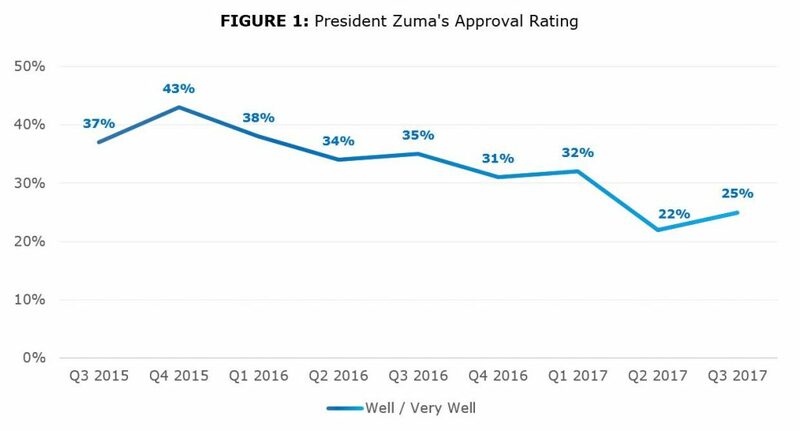 Over the past six months, South Africans have given President Jacob Zuma the worst performance ratings of any President since the advent of our country’s democracy. 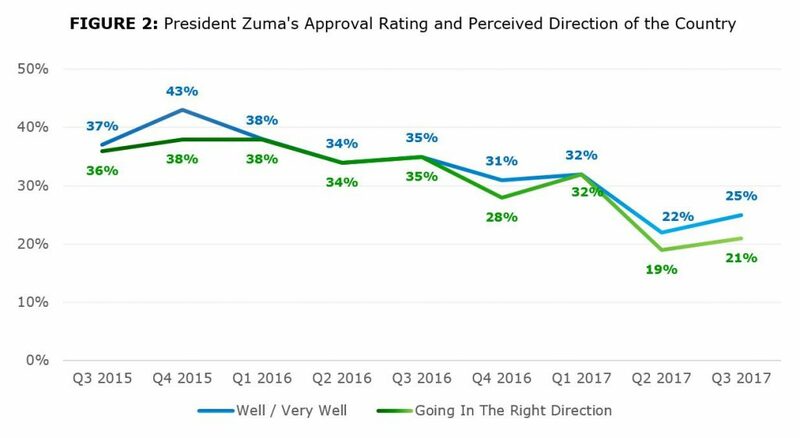 Only one-in-four South Africans (25%) believe Zuma is doing a good job, while over seven-in-ten (72%) said that he is doing ‘badly’ or ‘very badly’, according to the South African Citizens Survey (SACS), which Citizen Surveys has run on a monthly basis since mid-2015. 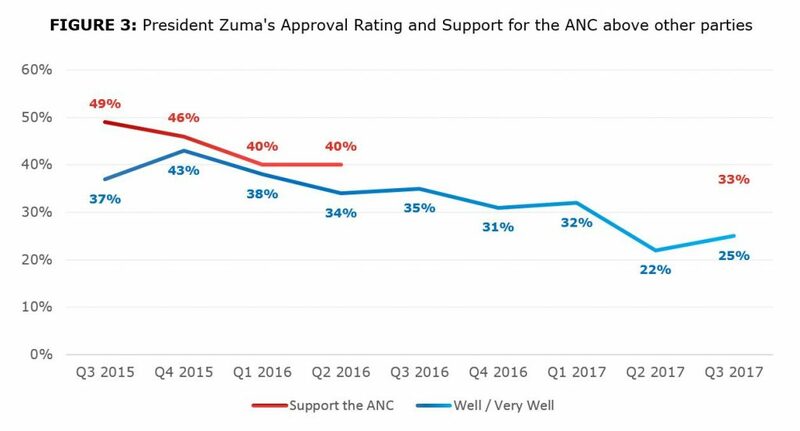 While Zuma’s popularity has been declining since 2015, his support levels plummeted by 10% in April 2017 on the heels of the public storm that followed the March cabinet re-shuffle and the sacking of Finance Minister Pravin Gordhan. This decline in public satisfaction with the President’s performance has gone hand-in-hand with a decline in citizens’ optimism about the future of the country. Currently, just 21% of adult South Africans believe that the country is headed in the right direction, while more than two-thirds (70%) say that it is headed in the wrong direction. While people’s assessment of the current state of the economy have been at low levels for the past two years, they do not account for the recent sharp declines in national optimism. Surprisingly, a significant number of South Africans are hopeful that their personal living conditions will improve in the next 12 months. This strongly suggests that sagging public confidence is driven by the behaviour of the President and his government, and the resulting media firestorms over events such as the Cabinet reshuffle. The continuing controversy over the “capture” of key state enterprises by Gupta-aligned Ministers or directors, and other instances of plundering and corruption, have also contributed to the lack of faith in the president’s leadership and in the future of South Africa. 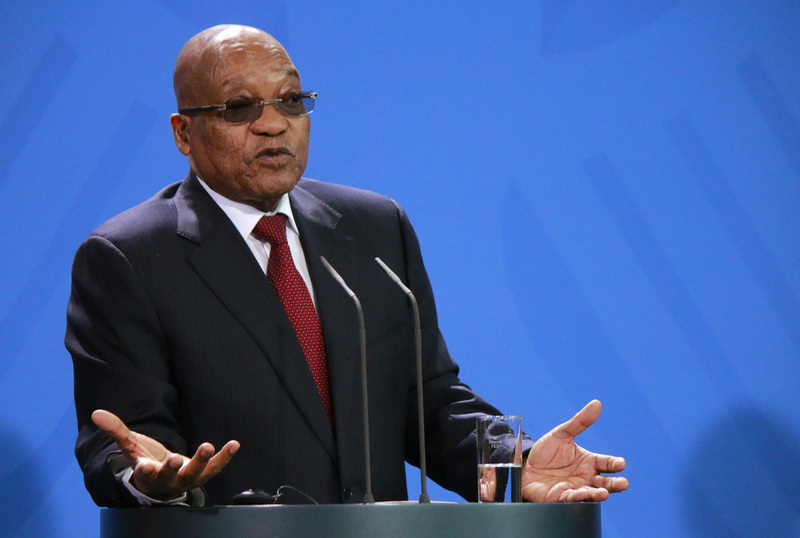 The fortunes of the ruling African National Congress (ANC) are tied to the President and his government. Beginning in July 2015, the South African Citizens Survey asked South Africans to rate how much they “like or dislike” each major political party. In mid-2015, 61% of South Africans gave the ANC a positive score. Now, two years later, only 43% of South Africans feel this way. Support for the ANC has also declined amongst the party’s dedicated supporters – and most likely voters. The proportion of respondents who had previously rated the ANC much higher than other political parties has shrunk, from one-half (49%) of the electorate in mid-2015 to just one-third (33%) in the recent months. These findings don’t bode well for the ANC. There is a significant risk that President Jacob Zuma is decreasing support for the ANC and undermining South Africans’ faith in the future of the country. The ANC clearly has some difficult decisions ahead.